For theories, strategies, concepts and doctrines of warfare, see Military science. Military technology is the application of technology for use in warfare. It comprises the kinds of technology that are distinctly military in nature and not civilian in application, usually because they lack useful or legal civilian applications, or are dangerous to use without appropriate military training. 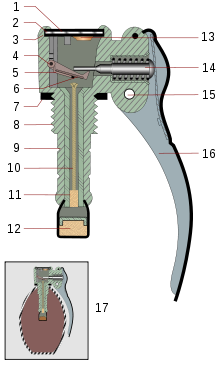 The line is porous; military inventions have been brought into civilian use throughout history, with sometimes minor modification if any, and civilian innovations have similarly been put to military use. Military technology is often researched and developed by scientists and engineers specifically for use in battle by the armed forces. Many new technologies came as a result of the military funding of science. Weapons engineering is the design, development, testing and lifecycle management of military weapons and systems. It draws on the knowledge of several traditional engineering disciplines, including mechanical engineering, electrical engineering, mechatronics, electro-optics, aerospace engineering, materials engineering, and chemical engineering. This section is divided into the broad cultural developments that affected military technology. The first use of stone tools may have begun during the Paleolithic Period. The earliest stone tools are from the site of Lomekwi, Turkana, dating from 3.3 million years ago. Stone tools diversified through the Pleistocene Period, which ended ~12,000 years ago. The earliest evidence of warfare between two groups is recorded at the site of Nataruk in Turkana, Kenya, where human skeletons with major traumatic injuries to the head, neck, ribs, knees and hands, including an embedded obsidian bladelet on a skull, are evidence of inter-group conflict between groups of nomadic hunter-gatherers 10,000 years ago. Humans entered the Bronze Age as they learned to smelt copper into an alloy with tin to make weapons. In Asia where copper-tin ores are rare, this development was delayed until trading in bronze began in the third millennium BCE. In the Middle East and Southern European regions, the Bronze Age follows the Neolithic period, but in other parts of the world, the Copper Age is a transition from Neolithic to the Bronze Age. Although the Iron Age generally follows the Bronze Age, in some areas the Iron Age intrudes directly on the Neolithic from outside the region, with the exception of Sub-Saharan Africa where it was developed independently. The first large-scale use of iron weapons began in Asia Minor around the 14th century BCE and in Central Europe around the 11th century BCE followed by the Middle East (about 1000 BCE) and India and China. The Assyrians are credited with the introduction of horse cavalry in warfare and the extensive use of iron weapons by 1100 BCE. Assyrians were also the first to use iron-tipped arrows. An illustration of a trebuchet catapult, as described in the Wujing Zongyao of 1044. The Wujing Zongyao (Essentials of the Military Arts), written by Zeng Gongliang, Ding Du, and others at the order of Emperor Renzong around 1043 during the Song dynasty illustrate the eras focus on advancing intellectual issues and military technology due to the significance of warfare between the Song and the Liao, Jin, and Yuan to their north. The book covers topics of military strategy, training, and the production and employment of advanced weaponry. A Chinese flamethrower from the Wujing Zongyao manuscript of 1044 CE, Song dynasty. The 14th-century Huolongjing was also one of the first Chinese texts to carefully describe to the use of explosive land mines, which had been used by the late Song Chinese against the Mongols in 1277, and employed by the Yuan dynasty afterwards. The innovation of the detonated land mine was accredited to one Luo Qianxia in the campaign of defense against the Mongol invasion by Kublai Khan,:192 Later Chinese texts revealed that the Chinese land mine employed either a rip cord or a motion booby trap of a pin releasing falling weights that rotated a steel flint wheel, which in turn created sparks that ignited the train of fuses for the land mines. :199 Furthermore, the Song employed the earliest known gunpowder-propelled rockets in warfare during the late 13th century,:477 its earliest form being the archaic Fire Arrow. When the Northern Song capital of Kaifeng fell to the Jurchens in 1126, it was written by Xia Shaozeng that 20,000 fire arrows were handed over to the Jurchens in their conquest. An even earlier Chinese text of the Wujing Zongyao ("Collection of the Most Important Military Techniques"), written in 1044 by the Song scholars Zeng Kongliang and Yang Weide, described the use of three spring or triple bow arcuballista that fired arrow bolts holding gunpowder packets near the head of the arrow. :154 Going back yet even farther, the Wu Li Xiao Shi (1630, second edition 1664) of Fang Yizhi stated that fire arrows were presented to Emperor Taizu of Song (r. 960–976) in 960. Rapid development in military technology had a dramatic impact on armies and navies in the industrialized world in 1840-1914. For land warfare, cavalry faded in importance, while infantry became transformed by the use of highly accurate more rapidly loading rifles, and the use of smokeless powder. Machine guns were developed in the 1860s. Artillery became more powerful as new high explosives (based on nitroglycerin) arrived after 1860, and the French introduced much more accurate rapid-fire field artillery. Logistics and communications support for land warfare dramatically improved with use of railways and telegraphs. Industrialization provided a base of factories that could be converted to produce munitions, as well as uniforms, tents, wagons and essential supplies. Medical facilities were enlarged and reorganized based on improved hospitals and the creation of modern nursing, typified by Florence Nightingale in Britain during the Crimean War of 1854-56. Naval warfare was transformed by many innovations, most notably the coal-based steam engine, highly accurate long-range naval guns, heavy steel armour for battleships, mines, and the introduction of the torpedo, followed by the torpedo boat and the destroyer. Coal after 1900 was eventually displaced by more efficient oil, but meanwhile navies with an international scope had to depend on a network of coaling stations to refuel. The British Empire provided them in abundance, as did the French Empire to a lesser extent. War colleges developed, as military theory became a specialty; cadets and senior commanders were taught the theories of Jomini, Clausewitz and Mahan, And engaged in tabletop war games. Around 1900, entirely new innovations such as submarines and airplanes appeared, and were quickly adapted to warfare by 1914. The British HMS Dreadnought (1906) incorporated so much of the latest technology in weapons, propulsion and armour that it at a stroke made all other battleships obsolescent. New financial tools were developed to fund the rapidly increasing costs of warfare, such as popular bond sales and income taxes, and the funding of permanent research centers. 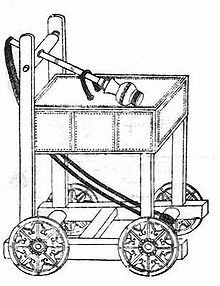 Many 19th century innovations were largely invented and promoted by lone individuals with small teams of assistants, such as David Bushnell and the submarine, John Ericsson and the battleship, Hiram Maxim and the machine gun, Ernest Swinton and the tank, and Alfred Nobel and high explosives. By 1900 the military began to realize that they needed to rely much more heavily on large-scale research centers, which needed government funding. They brought in leaders of organized innovation such as Thomas Edison in the U.S. and chemist Fritz Haber of the Kaiser Wilhelm Institute in Germany. The postmodern stage of military technology emerged in the 1940s, And one with recognition thanks to the high priority given during the war to scientific and engineering research and development regarding nuclear weapons, radar, jet engines, proximity fuses, advanced submarines, aircraft carriers, and other weapons. The high-priority continues into the 21st century. It involves the military application of advanced scientific research regarding nuclear weapons, jet engines, ballistic and guided missiles, radar, biological warfare, and the use of electronics, computers and software. During the Cold War, the world's two great superpowers — the Soviet Union and the United States of America — spent large proportions of their GDP on developing military technologies. The drive to place objects in orbit stimulated space research and started the Space Race. In 1957, the USSR launched the first artificial satellite, Sputnik 1. By the end of the 1960s, both countries regularly deployed satellites. Spy satellites were used by militaries to take accurate pictures of their rivals' military installations. As time passed the resolution and accuracy of orbital reconnaissance alarmed both sides of the iron curtain. Both the United States and the Soviet Union began to develop anti-satellite weapons to blind or destroy each other's satellites. Laser weapons, kamikaze style satellites, as well as orbital nuclear explosion were researched with varying levels of success. Spy satellites were, and continue to be, used to monitor the dismantling of military assets in accordance with arms control treaties signed between the two superpowers. To use spy satellites in such a manner is often referred to in treaties as "national technical means of verification". The superpowers developed ballistic missiles to enable them to use nuclear weaponry across great distances. As rocket science developed, the range of missiles increased and intercontinental ballistic missiles (ICBM) were created, which could strike virtually any target on Earth in a timeframe measured in minutes rather than hours or days. In order to cover large distances ballistic missiles are usually launched into sub-orbital spaceflight. 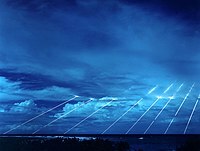 Test of the LG-118A Peacekeeper missile, each one of which could carry 10 independently targeted nuclear warheads along trajectories outside of the Earth's atmosphere. As soon as intercontinental missiles were developed, military planners began programmes and strategies to counter their effectiveness. A significant portion of military technology is about transportation, allowing troops and weaponry to be moved from their origins to the front. Land transport has historically been mainly by foot, land vehicles have usually been used as well, from chariots to tanks. When conducting a battle over a body of water, ships are used. There are historically two main categories of ships: those for transporting troops, and those for attacking other ships. Soon after the invention of aeroplanes, military aviation became a significant component of warfare, though usually as a supplementary role. The two main types of military aircraft are bombers, which attack land- or sea-based targets, and fighters, which attack other aircraft. Military vehicles are land combat or transportation vehicles, excluding rail-based, which are designed for or in significant use by military forces. Military aircraft includes any use of aircraft by a country's military, including such areas as transport, training, disaster relief, border patrol, search and rescue, surveillance, surveying, peacekeeping, and (very rarely) aerial warfare. Warships are watercraft for combat and transportation in and on seas and oceans. Fortifications are military constructions and buildings designed for defense in warfare. They range in size and age from the Great Wall of China to a Sangar. Sensors and communication systems are used to detect enemies, coordinate movements of armed forces and guide weaponry. Early systems included flag signaling, telegraph and heliographs. 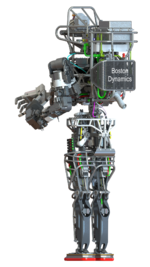 A high-resolution computer drawing of the Atlas robot designed by Boston Dynamics and DARPA, as seen from behind. The Defense Advanced Research Projects Agency is an agency of the United States Department of Defense responsible for the development of new technologies for use by the military. DARPA leads the development of military technology in the United States and today, has dozens of ongoing projects; everything from humanoid robots, to bullets that are able to change path before reaching their target. China has a similar agency. In 2011, the US Defense Department declared cyberspace a new domain of warfare; since then DARPA has begun a research project known as "Project X" with the goal of creating new technologies that will enable the government to better understand and map the cyber territory. Ultimately giving the Department of Defense the ability to plan and manage large-scale cyber missions across dynamic network environments. Wikimedia Commons has media related to Military technology. Bellifortis, late medieval treatise on military technology. ^ Wescott, David (1999). Primitive Technology: A Book of Earth Skills. Layton, UT: Society of Primitive Technology, Gibbs Smith. p. 60. ISBN 978-0-87905-911-8. ^ Iron In Africa: Revising The History : Unesco. Portal.unesco.org. Retrieved on 2014-11-20. ^ a b Tucker, Spencer (2010). A Global Chronology of Conflict. Santa Barbara, CA: ABC-CLIO, LLC. pp. 6–7. ISBN 978-1-85109-672-5. ^ "Teachers' Guide for Military Technology" (PDF). 2001-11-26: 1. Retrieved 2014-11-20. ^ a b c d e f g h i j k l m n o p Ping-Yü, with the collaboration of Ho; Gwei-Djen, Lu; Ling, Wang (1986). Science and Civilization in China. The Gunpowder Epic (1. publ. ed.). Cambridge: Cambridge U.P. ISBN 9780521303583. Retrieved 20 November 2014. ^ Needham, Volume 5, Part 7, 224–225. ^ Gwei-Djen, Lu; Joseph Needham; Phan Chi-Hsing (July 1988). "The Oldest Representation of a Bombard". Technology and Culture. 29 (3): 594–605. doi:10.2307/3105275. JSTOR 3105275. ^ Partington, J.R. (1960). A History of Greek Fire and gunpowder (Johns Hopkins paperback ed.). Cambridge: Heffer. p. 211. ISBN 9780801859540. Retrieved 20 November 2014. ^ Max Boot, War made new: technology, warfare, and the course of history, 1500 to today (Penguin, 2006). ^ B.H. Liddell Hart, "Armed Forces in the Art of War: Armies", in J.P.T. Bury, ed., The New Cambridge Modern History: volume X: The Zenith of European Power 1830-70 (1967), 302-330. ^ Michael Lewis, "Armed Forces in the Art of War: Navies", in J.P.T. Bury, ed., The New Cambridge Modern History: Volume X: The Zenith of European Power 1830-70 (1967), 274-301. ^ David K. Brown, Warrior to Dreadnought: Warship Development 1860–1905(2003). ^ Michael Howard, "The armed forces." In F.H. Hinsley, ed. ‘’The new Cambridge modern history: volume XI: 1870-1898" (1962) pp 204-42. ^ John Sumida, In Defence of Naval Supremacy: Finance, Technology, and British Naval Policy 1889-1914 Naval Institute Press, 2014. ^ McBride, William M. (1992). "'The Greatest Patron of Science'? : The Navy-Academia Alliance and US Naval Research, 1896-1923". Journal of Military History. 56 (1): 7. doi:10.2307/1985709. JSTOR 1985709. ^ Jeffrey, Thomas E. (2016). "'Commodore' Edison Joins the Navy: Thomas Alva Edison and the Naval Consulting Board". Journal of Military History. 80 (2): 411–46. ^ L.F. Haber, The poisonous cloud: chemical warfare in the First World War (Oxford UP, 1986). ^ Harry Bondy, "Postmodernism and the source of military strength in the Anglo West." Armed Forces & Society 31#1 (2004): 31-61. ^ Everett Mendelsohn, Merritt Roe Smith, and Peter Weingart, eds. Science, technology and the military (Springer Science & Business Media, 2013). ^ Pellerin, Cheryl. "DARPA's Plan X Uses New Technologies to 'See' Cyber Effects". America Forces Press Service. US Department of Defense. Retrieved 21 November 2014. Andrade, Tonio. The Gunpowder Age: China, military innovation, and the rise of the West in world history (Princeton UP, 2016). Boot, Max. War made new: technology, warfare, and the course of history, 1500 to today (Penguin, 2006). Dupuy, Trevor N. The evolution of weapons and warfare (1984), 350pp, cover 2000 BC to late 20th century. Ellis, John. The Social History of the Machine Gun (1986). Gabriel, Richard A., and Karen S. Metz. From Sumer to Rome: The Military capabilities of ancient armies (ABC-CLIO, 1991). Hacker, Barton (2005). "The Machines of War: Western Military Technology 1850–2000". History & Technology. 21 (3): 255–300. doi:10.1080/07341510500198669. Levy, Jack S (1984). "The offensive/defensive balance of military technology: A theoretical and historical analysis". International Studies Quarterly. 28 (2): 219–238. doi:10.2307/2600696. JSTOR 2600696. McNeill, William H. The Pursuit of Power: Technology, Armed Force, and Society since A.D. 1000 (1984). Parker, Geoffrey. The Military Revolution: Military Innovation and the Rise of the West (1988). Steele, Brett D. and Tamara Dorland. Heirs of Archimedes: Science & the Art of War through the Age of Enlightenment (2005) 397 pp. This page was last edited on 9 April 2019, at 22:46 (UTC).